The Golden State Warriors keep walking all over the Houston Rockets with a 126-113 win, sweeping the season series between the teams, but Stephen Curry is getting some preferential treatment from referees and should have been ejected in the third quarter, although it wouldn’t have made much of a difference. The Houston Rockets didn’t show up. James Harden did with 33 points but the rest of the team looked painfully clueless when it came to doing something creative on the floor or putting the ball in the basket. Dwight Howard scored just 7 points, turned the ball over five times and couldn’t get to the line, as he felt the interior defense from Andrew Bogut once again. The Warriors do tend to get away with being over physical at home and sometimes more than that, but it’s hard to argue about the efficiency of their defense. They’re fourth in the NBA when it comes to defending shots from 5 feet or under, holding teams to 49%. The Rockets lost for the third time this season with Harden scoring at least 30 points. Two of those losses were to the Warriors. Klay Thompson didn’t do a great job on Harden this time, but his 27 points to lead the team made up for that. Stephen Curry scored 22 points to go with 10 assists while Draymond Green scored 18 points. Andrew Bogut finished with 9 points, 10 rebounds and 5 blocks, three of them coming against Dwight Howard. Why should have Curry been ejected? He was called for a technical foul after elbowing Patrick Beverley in the face. Beverley might not be the most pleasant player to be guarded by in the world, but Curry took the dirty way out and was called for it. A minute later he fouled Trevor Ariza and was called for it. 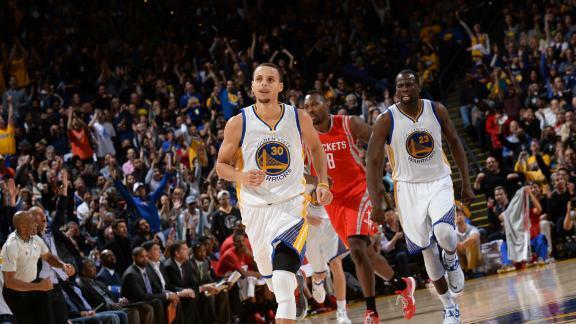 Ariza bumped into Curry, and Curry went down the court, chasing him to settle scores. Draymond Green held him back, but for some reason Curry didn’t get his second T for his retaliation attempt. But it didn’t really change the game. Just add to the frustration of the Rockets, later causing Josh Smith to get tossed from the game. It didn’t matter. The Warriors sweep the season series with four wins against Houston, all of them in double figure margin. Does it means something about the championship? The Rockets swept the Spurs last season but didn’t meet up in the playoffs. This advantage won’t matter unless they meet again.